It’s late summer and the best season for eating. 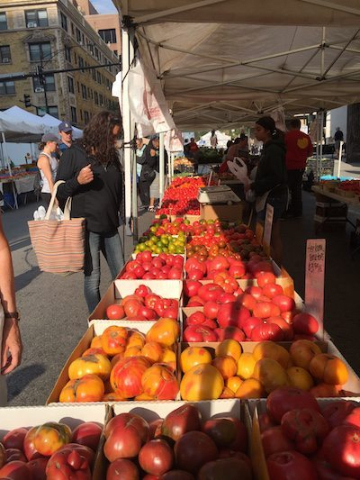 Corn, melons, peaches, roma beans and best of all tomatoes. Small tomatoes, large tomatoes. Red and yellow and orange and green and striped. I love all my summer tomatoes. And I eat them every day in August and September. Raw, sliced with salt and pepper. In salads, sandwiches and cooked in sauces. There’s nothing better on pasta than fresh tomato sauce. Some of my lucky friends have gardens and grow their own tomatoes. I’m a cliffdweller, so I have nowhere to grow my own. But every Saturday, there’s a farmers market just three blocks from my door. And every Saturday I replenish my tomato supply. 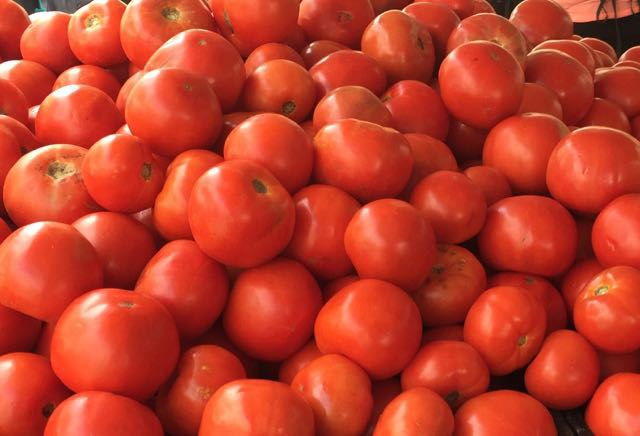 Many of the growers on the two-block stretch of Division Street have their own tomatoes, but Dotson’s Farm is my favorite. 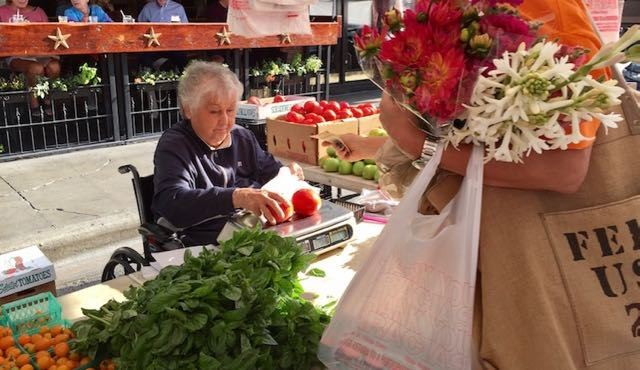 My tomato lady sits behind a scale and adds up my purchases on a notepad. Tomatoes, peppers, roma beans (they have a short season), a bunch of basil or parsley, perhaps some beets and a few ears of corn. But always tomatoes. Here are some of my favorite ways to consume them, besides just sliced plain with salt and pepper. Fresh French or Italian or good rye bread (hard to find). Sliced tomatoes, sliced fresh mozzarella or a thin slice of sweet onion, a little mayo or olive oil. A few basil leaves if you have some. Sliced large red tomatoes, sliced fresh mozzarella (sliced from a large ball of mozzarella). Spread artfully around a large salad plate lined with leaf lettuce, spinach or chopped romaine. Drizzle olive oil on all the vegetables, then red wine vinegar or balsamic vinegar (less, because it’s more potent). Slivered basil leaves, salt and pepper. Mix all gently together and enjoy! Diced fresh tomato, diced sweet onion, olive oil. Add chunks of fresh or regular mozzarella or provolone just before serving. Every September, I buy a small basket of roma tomatoes for freezing. I just wash them and let them dry. Place 8-10 tomatoes in a freezer bag and stow in the freezer. When you want a taste of summer in the winter, remove a bag of tomatoes and let them thaw slightly. If you hold a tomato under running water, you’ll be able to slip off the skin easily. Then just core and chop to make a wonderful fresh sauce. Heat some olive oil in a saucepan and sauté a chopped onion and some garlic until limp and golden. Add the diced tomatoes and juices. Bring to a simmer and cook for about 30 minutes, stirring occasionally. The tomatoes will cook down and thicken into a sauce. Season with salt, pepper and herbs if you wish. Finally, I’ll let you in on my recipe for the best pasta sauce ever. Roasting the tomatoes adds a certain nutty, burnt richness to the sauce. * I don’t peel them and the skins get broken up in the cooking and blending process. But if you’re picky about tomato skin, you’ll just have to peel your tomatoes. A waste of time, in my mind. In a large roasting pan, toss together the tomatoes, onions, garlic, herbs, olive oil, salt, and pepper. Roast for 25 minutes. Stir the vegetables. Roast for another 25 minutes and toss. Add any of the optional ingredients listed below and roast for another 45 minutes, or until the tomatoes are softened and there’s a golden brown crust on top. Remove and taste for seasoning. If the sauce tastes bitter, add some of the sugar, gradually. You can use this as a sauce, although it will be soupy. I prefer to pour everything into a large saucepan, simmer for 20-30 minutes and use an immersion blender to get a better consistency (still chunky, not smooth). Simmer for another 15-20 minutes if you want a thicker sauce. Place in glass or plastic containers and refrigerate or freeze. The sauce can be refrigerated for a week or frozen tightly sealed for several months to a year. Variations: Add any of the following ingredients to the sauce after it has roasted for about 50 minutes and before simmering. Drained capers; sliced pitted black and/or green olives, olive puree or tapenade; chopped raw or cooked vegetables (minced carrots, zucchini, red or green pepper); anchovy filets, minced, or 1 tablespoon anchovy puree; a good dash of red chile flakes or hot pepper sauce. Photos and posted by Nancy Bishop and Third Coast Review.